Left: photo by Shane Morrissey. Right: slender beaked moss forms large moss mats on rotting logs and tree trunks. Photo by Linda Brown. 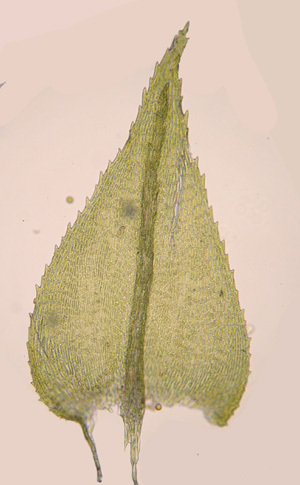 Slender beaked moss varies in colour from light to dark brownish-green or olive-green. It has long (to 10 cm), creeping arched stems, and is once or twice pinnately branched. This branching is irregular and often, and the slender branches intertwine to form untidy, tangled mats. The leaves are 1.5 mm long, have a strong midrib, and are edged with small teeth. Stem leaves bend away from the stem at right angles, and have a broad elliptic shape that narrows to a sharp point. Branch leaves are narrower and spread less. The sporophytes are reddish brown, with black stems. They branch off the side of the stem, and occur occasionally. Click here for further ID information and close-up photos. 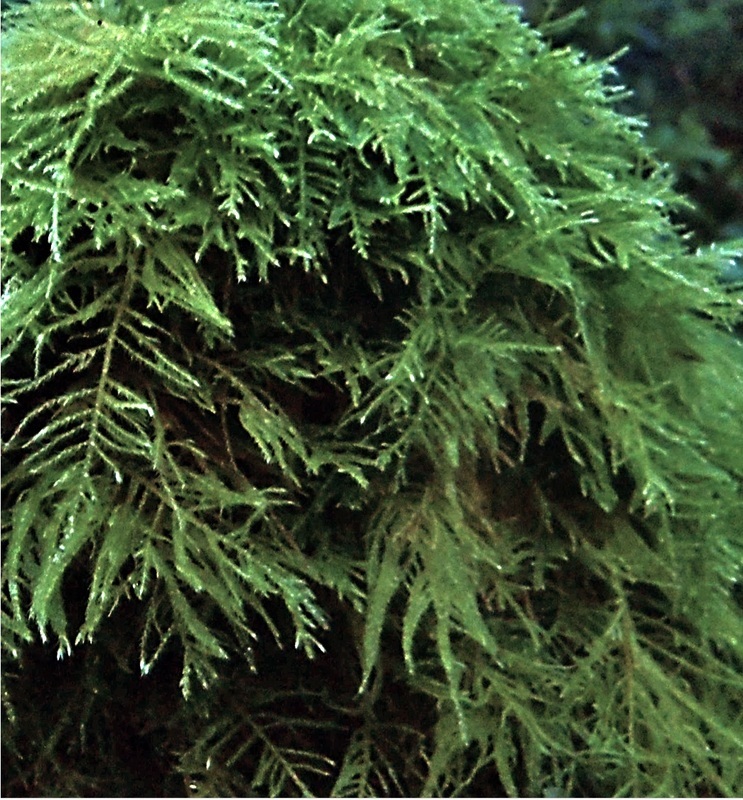 Slender beaked moss grows on rotting logs, humus, and tree trunks in damp, swampy areas low to subalpine forests. The stems interweave to form large mats. It often grows with Oregon beaked moss (Kindbergia oregana). It is a circumpolar species in the Northern Hemisphere, and is found in various other locations around the world including Australia, Asia, and South America. Its range stretches across much of North America; on the west coast it is found from southeastern Alaska to California. Slender beaked moss could be confused with Oregon beaked moss, especially as these species grow in similar habitats and often occur together. Oregon beaked moss is more evenly branched and orderly, and generally larger, whereas slender beaked moss is more scraggly and disorderly in appearance with irregular branching. 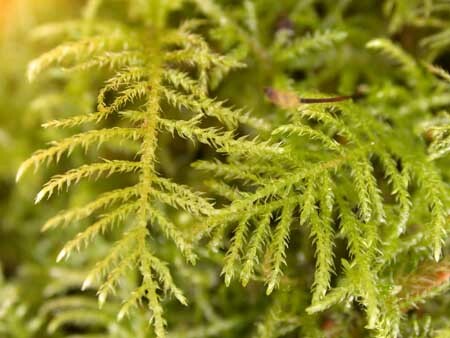 Oregon beaked moss branches once pinnately, while slender beaked moss can branch once or twice pinnately. Eurhynchium praelongum (Hedw.) Schimp. In Klinkenberg, Brian. (Ed.). E-Flora BC: Electronic Atlas of the Plants of British Columbia. Lab for Advanced Spatial Analysis, Department of Geography, University of British Columbia, Vancouver. Accessed on 19/11/2013. Ellis, S. Eurhynchium praelongum. Introduction to Bryophytes. Biology 321, Department of Biology, University of British Columbia, Vancouver. Accessed 03/09/2013. Pojar, J. and MacKinnon, A. (1994). Plants of Coastal British Columbia. Vancouver, BC: Lone Pine Publishing. P. 470. Schofield, W.B. (1992). Some Common Mosses of British Columbia. Victoria, BC: Royal British Columbia Museum. Pp. 186-187.